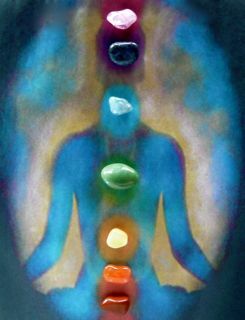 After reading my novel, The Chakra Diaries, many wonder which of their chakras may be out of balance. There’s a very good questionnaire at http://www.EclecticEnergies.com, that can give you an indication of which chakra/s could use strengthening. You can also have someone test you with a pendulum – any object hung on a string or chain that is able to swing freely. It works by responding to micro-muscular movements of the fingers, which are themselves responding to a focused question that you ask about something… you can choose what meaning to give to the following kinds of responses, e.g., clockwise circle – open chakra; counter-clockwise circle – closed chakra. I have also experienced a perfectly still pendulum when a chakra is closed. There’s more info on how I use the pendulum in the prologue to The Chakra Diaries. If you’re unsure which chakra to focus on, do a Chakra Meditation to balance all your chakras, starting at the root chakra, the base for all our security and balance in life. Try my guided visualization from The Chakra Diaries: Chakra Meditation.